Hi my name is Tom Wells, I am 15 years of age (weight 58 kg) and I have been windsurfing for about 3 years, and am eager to get into the windsurfing scene. I started dinghy sailing which I thoroughly enjoy with a friend 6 months before I started windsurfing. This gave me a huge advantage with the understanding of the theory behind windsurfing and some wind awareness. I first came across windsurfing because my dad and uncle windsurfed. It looked awesome to me! I was never into the average sports and hobbies like football that my friends at school where into. I have always loved the adrenaline and outdoor sports such as rock climbing and mountain biking. Windsurfing looked appealing to me with such a huge range of disciplines and paths to go down. It feels like there is no limit to what I can learn and what I can get out of the sport. From then on I was determined to achieve what my dad and uncle had done. But what really got me addicted to the sport was when I first got planing. Gliding over the water at what felt like 100 mph is still the best feeling in the world to me. At this point in time I am just stretching into the other disciplines and trying out whatever I can. My Dad has always been a wave sailor, and my uncle Steve is a speed sailor but at the moment I have an open mind for my future in windsurfing as all the disciplines seem appealing to me and I love all aspects of windsurfing. we are doing our best to tempt Tom over to Speedsurfing! He has a lot of talent which may or may not be genetic, it does seem to run in the family on both sides! At my school I was lucky enough to have a tutor who supported me through windsurfing and sailing and set up the Will Mackaness trust. The trust was set up following the untimely death of the former Head Boy (2007-2008) of The Wey Valley School and Sports College, Will Mackaness. Will was an avid sportsman who, however, took a full and active part in all aspects of school life, despite undergoing intensive treatment for the most aggressive form of brain tumour. One of Will’s passions was water sports especially windsurfing. 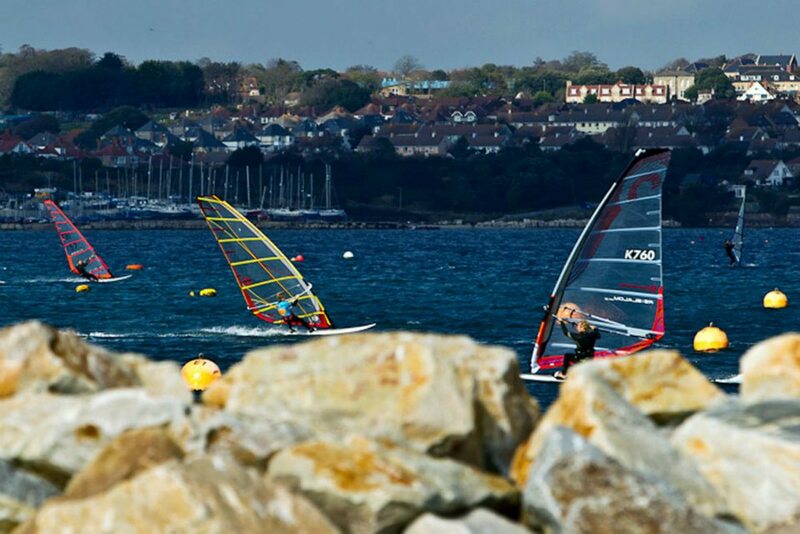 It is for this reason that the trust has been set up to help give more water sport opportunities to our pupils, so they can experience the fun and exhilaration of windsurfing, sailing, canoeing and kayaking for themselves. Water sports are such an expensive but immensely enjoyable activity and the trust aims to help support pupils who want to take it up or wish to progress further. I have benefited from the trust and is one of the reasons I have progressed to where I am now. I have always wanted to give something back to the trust and Ms Govier my tutor and I have organized an event from the OTC to Bowleaze Cove using windsurfers (unfortunately I wasn’t able to take part as I broke my wrist) which raised over £1000 pounds for the trust. Click to read the report by the Dorset echo. My first competitive event was about 2 years ago where I competed in the 2010 BSA master blaster 7 event in Weymouth. The wind was very strong. A mixture of not being used to the kit and taking out too bigger sail (as usual), resulted in me missing 3 races which really knocked my confidence. After switching to a smaller sail the next day I got some decent results and by the end of the event I managed to achieve a 6th out of 28 which I was very happy with. I found the weekend great fun for me and is what got me interested in the competitive side of windsurfing and encouraged me to do some of the UKWA events and put some training in for the next master blaster in Weymouth. A few months after the master blaster event I competed in the 2011 BSA master blaster 2 event in Weymouth. I decided to take out the lush new demo kit, a 2011 144lt Futura and a 7.5 m2 Ezzy sail. The first day was light winds and non planing conditions. All of the kit was nice and worked well and by the end of the day I think I was 6th, clearly light winds were not my strong point but I learned masses as I usually only go out in strong winds. The next day it was blowing around 25 knots and I took out a 2011 5.5 Tushingham storm and a 120 lt 2010 Starboard Futura. Took a few plunges but overall it was a fantastic day for me and I got some good results and managed to get me 3rd place overall and first under 17, beating people who had previously beaten me in the last event. 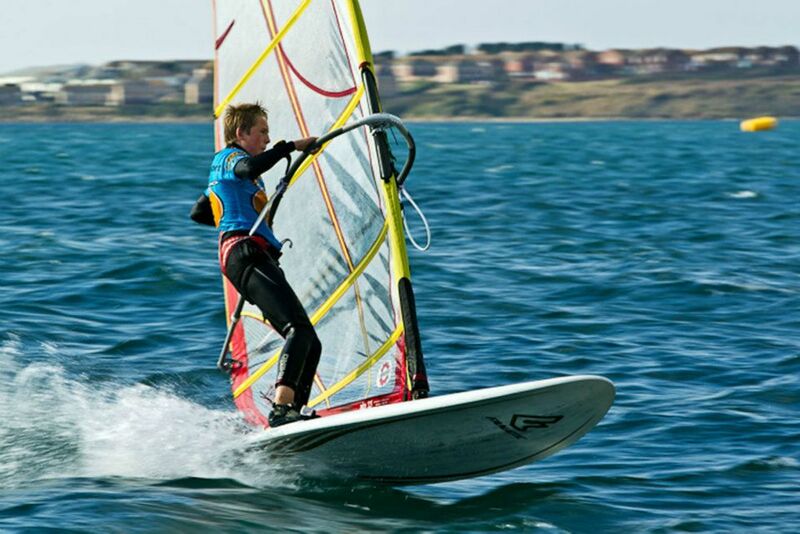 I have also recently come across the racing side of windsurfing. With all the sail for gold and Olympics coming to Weymouth I wanted to see what all the fuss was about. 6 months ago I entered my first bic techno 293 racing event. It was a little daunting for me as I have never been on a raceboard before. Techno’s are very different to short boards as they have a dagger board, mast track and that they are 205 ltrs. I managed to borrow some kit of someone for the weekend just so I would know if would like it before I went buying any kit. For someone that has only sailed in the sea my first visit to lake was a real eye opener. To see so many recreational sailors and windsurfers in such a small area with next to no facilities compared to the harbor. In the first day it was light winds and I came last in the first race last but as the races went on I slowly crept up the ladder. The second day though was very windy and it felt very strange planing along with a two hundred lt board. I was very overpowered and had a few extreme wipeouts, by the end of the event I came 18th out of 22. Since then I have bought my own kit and have been competing in events around the country and sometimes successfully beating world champions and national squad sailors. After less than one season racing Technos I have been picked for the south and south west zone squad which provides additional training and coaching. For the last BSA event in Weymouth for 2011 I thought I would try out the amateur class. The first day was very light winds and I took out a Sailworks 7.5 retro and a 2009 110 ltr ray with a 39cm fin. The races didn’t start in till a lot later as a result of the wind in on so I decided to go on a test run unfortunately I tried to show of doing some light wind freestyle and ended up making a hole in my board which was a complete nightmare but Tris Best offered to lend a hand and managed to repair the board just in time for the first race. By the time we got out I was powered up. After some tips from Simon Todd from Windtek the 5 mins had started unfortunately I had quite a bad start missing the horn by a few seconds but I managed to overtake a few people round the first mark although it wasn’t easy as there where about 5 people in the water round the mark. Most of the gibes I got planning out of which I was quite happy with. There weren’t anymore races that day. The next day was blowing an absolute gale there was at least three boards damaged and a sail blew into a storage trailer just while we where having a briefing. I rigged up my smallest sail a 5.5m Tushingham storm and the ray with a 30cm falcon fin. BIG MISTAKE. There was some large chop by the time we got out there Just managing to get out to the start line I realized quite how big mistake I had made. Si was on a 5.0 m2 sail along with a lot of other people. I had an amazing start at the boat end right on time after I crossed the line. I went over a bit of chop forcing me downwind and a gust of wind making biggest catapults ever. I winded myself quite badly hitting my chest on the boom but I forced myself to keep on going as I knew that it mean the difference between coming 10th or 20th. I managed to waterstart and time and time again I would be catapulted. I think I only made 3 gybes without falling in. Just after the last mark my downhaul went loose giving me even more power but I managed to finish. Only 4 of us out of 20 finished and I had to get rescued on the way back but it was worth it. I managed to change down my sail to a 4.8 which was better than nothing and I managed to get a 10th and a 9th. I came 8th out of 20 and 1st under 17 and I can’t wait to do more of the slalom events. 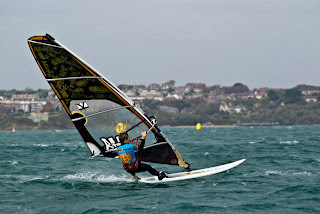 I have just been sponsored by Windtek as Simon the manager sees potential in me and has just introduced me to wavesailing which I really enjoyed. I have also been trying a bit of freestyle and am now trying to do Vulcan’s.